Cedar Valley Mennonite Church, 2017. Cedar Valley Mennonite Church is located in Chambersburg, Pennsylvania. It was established in 2006. In 2014 the congregation was served by Bishop Glenn R. Martin, Minister Joel M. Martin, and Deacon Joseph R. Rodes. The church had 107 members. Mennonite Church Directory 2014. Harrisonburg, VA: Christian Light Publications, Inc., 2014: 140. Location: From I-81, take Exit 10. Go east on Rt 914 2 miles to church on right. Thiessen, Richard D. "Cedar Valley Mennonite Church (Chambersburg, Pennsylvania, USA)." Global Anabaptist Mennonite Encyclopedia Online. March 2014. Web. 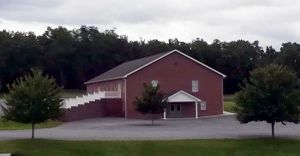 18 Apr 2019. http://gameo.org/index.php?title=Cedar_Valley_Mennonite_Church_(Chambersburg,_Pennsylvania,_USA)&oldid=155681. Thiessen, Richard D. (March 2014). Cedar Valley Mennonite Church (Chambersburg, Pennsylvania, USA). Global Anabaptist Mennonite Encyclopedia Online. Retrieved 18 April 2019, from http://gameo.org/index.php?title=Cedar_Valley_Mennonite_Church_(Chambersburg,_Pennsylvania,_USA)&oldid=155681. This page was last modified on 9 November 2017, at 16:17.